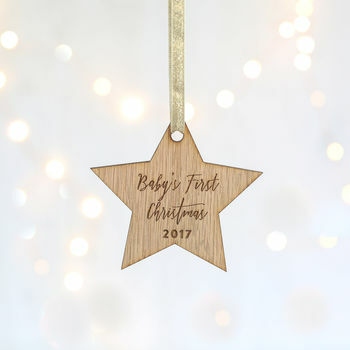 A gorgeous babys first christmas decoration to hang on your tree year after year, the perfect keepsake! Celebrate a baby's first christmas in style with this simple but beautiful wooden keepsake that can be used as a christmas tree decoration and treasured for years to come. Decoration reads 'Baby's first Christmas' and is personlised with the year. This item is currently reduced from its original price of £8. As the product hasn’t previously been available on notonthehighstreet.com, the original price represents our RRP and product price elsewhere.